The FreeStyle Lite glucometer requires only a 0.3 microliter blood sample size (the world's smallest sample size). This means that testing is almost pain free. This meter has a large display screen to ensure readings are clearly visible and also has a back light to help maintain clear readings even in poor lighting. The Freestyle Lite requires no coding and the test results show up in just 5 seconds! 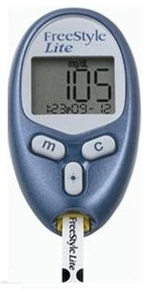 The Freestyle Lite Meter uses Freestyle Lite Test Strips and Freestyle Lancets.